During the shoulders season of summer camp, YMCA Camp Takodah plays home to 2000 youth annually that participate in our Outdoor Education programs. These intentional programs have an emphasis on community team building, ropes course, outdoor adventure and living skills, all paired with health sciences and physical education curriculum. We are committed to adapting our program to meet the needs of our groups which offers our staff an increased opportunity to work in a variety of programs and gain experience hosting and supporting large group events such as weddings, church retreats and community groups. We have a small staff team of 8-10 each season and are dedicated to finding the very best people to support our mission toward youth development. Our full-time leadership team is committed to personal and continued development of all seasonal staff with extended opportunities to join us at conferences in the off season. We live and work in a close community setting involving shared housing, shared meals, and often, shared recreational activities. If you are interested in applying for a position and learning more about these programs please feel free to apply online or contact us with a resume. Applicants who are selected for a staff role will need to submit the following forms via email. At Takodah I was able to work in a high energy, intentional programming environment geared towards enhancing participants communication skills, teamwork strategies and self-confidence. 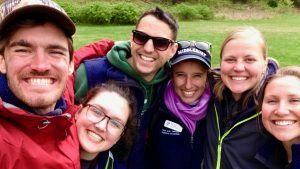 As a facilitator I had the rewarding opportunity to work as part of a passionate, close-knit team that thrived on developing fun, meaningful programs for kids. My experienced supervisors provided personal support and thoughtful feedback for me to develop and gave me the chance to grow my creative teaching methods and build upon my leadership and communication skill-sets.